1) It's a 10 miracle leave-in plus keratin - I use this every time after I shower before blowdrying to detangle and protect my hair from the heat. 2) TooFaced Primed & Poreless - This primer really helps to keep my makeup stay put throughout the day. 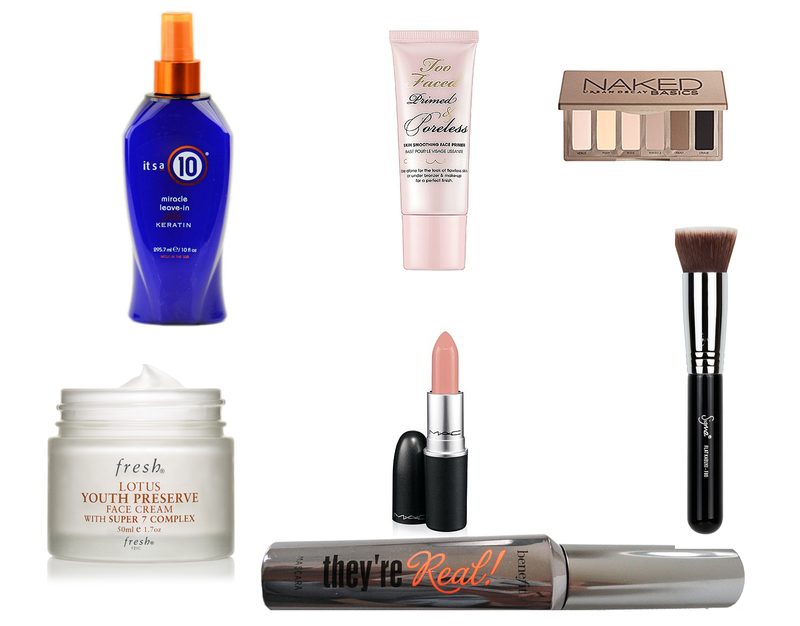 I can't live without a primer. 3) Naked Basics Palette - Perfect for on the go. I carry this around in case I decide to go out after work. Very basic colors but you can create a smokey eye look with it. I use the brown color Faint for my eyebrows and the color W.O.S everyday on top of primer to keep my oily lids stay matte throughout the day. 4) Fresh Lotus Youth Preserve Face Cream - I don't notice a lot of difference between this and the creams/lotions I've used in the past but this cream is a lot more hydrating and it smells like cucumbers. I just don't like that it's in a jar but other than that I don't have much to complain about. 5) Mac Lipstick in Blankety - I've been wearing a lot more nudes lately and this one is my go to and I top it off with the Maybelline Elixir in 055 to get a more glossy finish. 6) Sigma F80 Brush - My favorite foundation brush. This is the only sigma brush I own but I love it. It's so soft and dense and not a single hair has shed in the past 2.5 years of owning it. I will definitely be purchasing more sigma brushes in the future. 7) Benefit They're Real Mascara - I wouldn't say this is my favorite but it's been the mascara I've been using for the past 2 months. It's not as heavy as some other ones I've tried but it still does weigh my lashes down a little after curling it but no problem just curl it again after applying it. I own way too many sample sized mascaras which is why I haven't bought any in a really long time so until I go through all of it I will not be purchasing any mascaras. 8) Express Half Placket Shell Top in Black - this top is so light, sheer, super comfortable and fits my body really well. Since it's still cold on the east coast I just throw a cardigan over it. 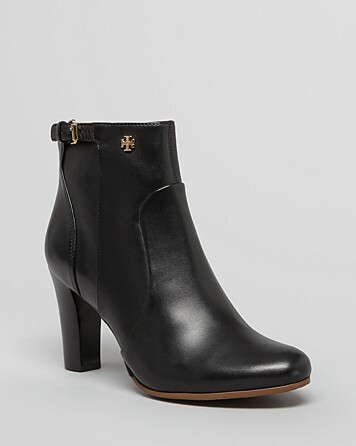 9) Tory Burch Bootie - This has been my favorite going out shoes. I don't like wearing 5" heels like I use to any more because they're just so uncomfortable and it hurts after couple hours so this bootie is the perfect heel height. It's super comfortable and I can last all day in them and so easy to pair them with jeans or leggings. 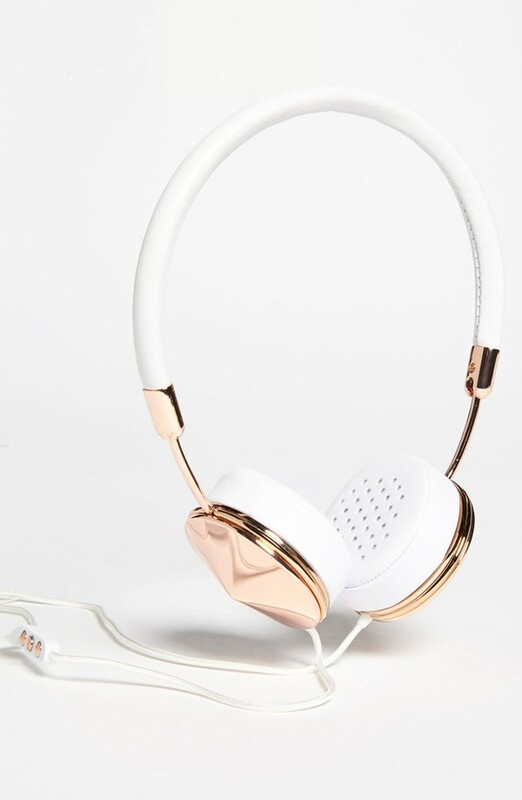 10) Frendz Headphones - I am in love with these! My sister bought them for my birthday and I love the white with rose gold! It also folds so you can put them in the small pouch it comes with making it easier to travel with. I hate when I throw my headphones in my bag and everything gets all tangled up.